Includes are reusable segments of code or content that you can use throughout your templates and email campaigns. The most common use of an include is to create a standard header or footer to use across multiple templates. When you need to make a change, you can just edit a single include rather than making changes manually across all of the affected templates. Click on the Content tab and select Includes. 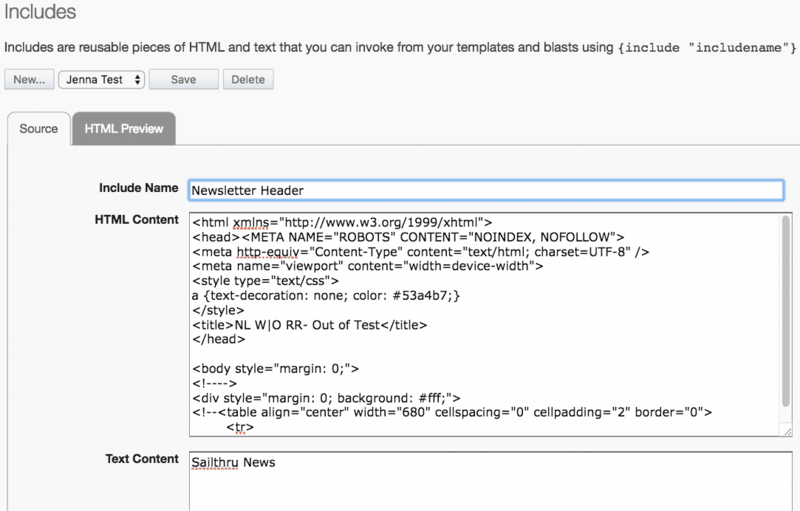 When creating an include, you must provide a name and create both an HTML and a Text version. Invoke the include in the Code tab of your template/campaign editor. This is done using the the 'include' function and the name of your include within Zephyr syntax. You may not contain an include within another include.